What a bunch of scrap...: Bo Bunny Giveaways coming!! Bo Bunny needs your help!! They have a BIG opportunity to bring you 40 days of giveaways! 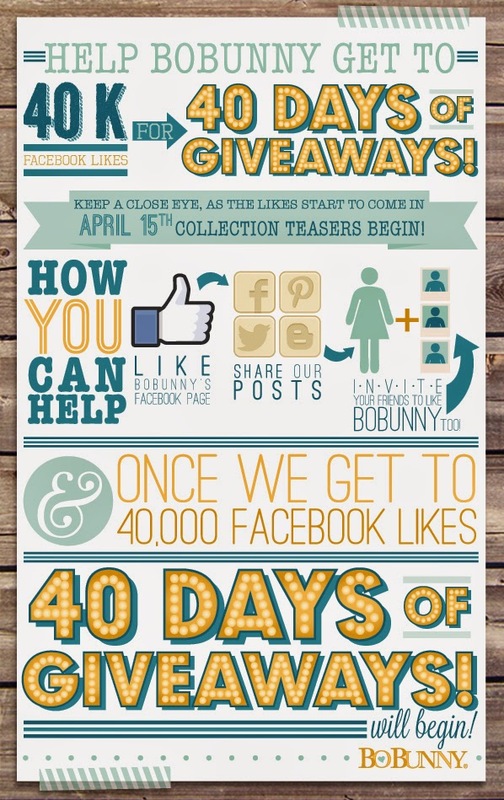 They can't start the giveaways until they reach 40,000 Facebook "LIKES"! Watch their Facebook every day this week for new Spring Collection teasers. Play along, "LIKE" their facebook page, comment on their posts, and tell your friends! Be sure to use our #40k40day hashtag this week as you play along with them!! Use all your resources - Pinterest, Instagram, Twitter, and Facebook to get the word out! After 40 K they are going to kick off the giveaways with their new Spring products!